Hedd WynBangor University Archives & Special Collections is commemorating the centenary of the death of Hedd Wyn with an exhibition celebrating the life, work and legacy of the Welsh poet and soldier who died on the first day of the Battle of Passchendaele on 31 July 1917. On display at the University are some of his pieces including a draft of the ode “Yr Arwr” which he planned to enter for the Chair Competition of the National Eisteddfod to be held in Birkenhead, 1917. Before he could finish his piece he was conscripted into the 15th Battalion of the Royal Welch Fusiliers and sailed to France. Bearing the pseudonym “Fleur de Lys” he posted his work back to Wales on the 15th July 1917. On July 31st Hedd Wyn went over the top with his regiment in a major offensive to capture ‘Pilckem Ridge’ in what would become known as the Battle of Passchendaele (or the Third Battle of Ypres). 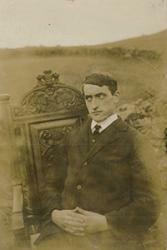 Men were falling on all sides, amongst them Hedd Wyn who was mortally wounded. Also on display is Hedd Wyn’s letter “Rhiwle yn Ffrainc,” which was written about 5 weeks before the National Eisteddfod in Birkenhead, in which he describes life "behind the lines" of the Western Front. The piece contains fantastic descriptions, including a famous description of an old shell with flowers growing out of it – the contrast between something beautiful and something horrific and barbaric. He also writes that France's flowers will be doleful in the future and a sad wind will blow over her acres because the colour of blood will be in one and the sound of sorrow will be in another. It almost predicts the symbolism of the Remembrance Day poppy. The exhibition is on display from June 5th until December 15th 2017 in the Council Chamber Corridor of the Main Arts Building. Items from the Exhibition wil also be available to be viewed at Bangor University's stand at the National Eisteddfod 2017 on Friday the 11th August.